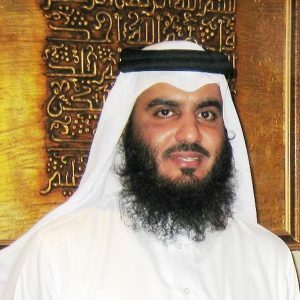 Ahmed Ali Al-Ajmi is a Qur’an reciter from Khobar, an eastern Province of the Kingdom of Saudi Arabia. He was born on February 24, 1968. After graduating from Mohamed Bin S`ud Islamic University, Ahmed flew to Pakistan where he enrolled in Lahore Public University to prepare a Master and then a Doctorate in Qur’an Interpretation. His thesis was entitled “Minnat Al-`Aliy Al-Kabir Fi sharh Turoq At-Tafsir” (a study of interpretation means). Sheikh Ahmed is one of the most outstanding reciters in the world. He first led prayers in 1984 (1404 Hijri) in Al-Mughirah Bin Sh`ubah Mosque and then in the Great Mosque of Khobar in 1985. He was recruited as Imam to Al Amir Mohamed Bin Fahd Mosque in Khobar in 1992. Al-Ajmi is currently leading prayers at Jeddah’s Grand Mosque.